Square Enix's timeless SNES classic is reborn on Nintendo DS. Chrono Trigger, released for the Super Nintendo in 1995, is one of the best role-playing games, an excellent fusion of phenomenal gameplay and a grand presentation. A dream team of developers, including Final Fantasy alums Hironobu Sakaguchi and celebrated composer Nobuo Uematsu, also designed it. Now Square Enix resurrects its classic on the Nintendo DS, which will release this holiday season to a whole new generation of gamers. 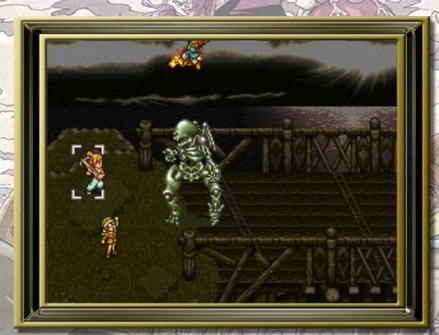 Much like Final Fantasy III and the upcoming Final Fantasy IV remakes, Chrono Trigger will feature its original content as well as bonus features. However, it doesn't seem like Square Enix has the intention of taking those adorable 2-D sprites and bringing them into the third dimension. That said, we expect the game to appear in all its old school, top down glory. In addition, the time traveling tale of Crono and his friends is intact, as they race to stop an evil from destroying the world and alter history in the process. That also means you'll enjoy the game's wonderful soundtrack, a collection of music so grand you'll hum it yourself long after you hit the power button. Gameplay is a great mix of classic RPG adventuring where you visit towns, talk to hundreds of non-player characters and fight a host of enemies. Chrono Trigger has Active Time Battles and Tech skills, with all members of the party getting in on the action once their counters hit zero. Furthermore, you have the option of skipping battles, since enemies appear on the map. As for the new features, expect touch screen gameplay as well as a new dungeon to explore and a Wireless Play mode, though Square Enix hasn't commented on what that entails. Perhaps two players can beat the game co-operatively or compete against each other to see who nabs the most loot. Square Enix has shown DS lots of love and Chrono Trigger might be the best game yet. Its amazing audio, addictive combat and intriguing narrative makes it one of the best of all time. Prepare to embark on this magical journey and keep an eye out for our hands-on impressions.